What’s on your checklist when looking for the ideal SUV? Is it reliability, power, comfort? Well the Nissan Armada hits all of those points and then some. The luxurious interior of the Armada can seat up to 8 passengers comfortably. Nissan ensures that there is no lack of storage space with the Armada, considering it’s equipped with 97 cubic feet of potential cargo room. Don’t let the versatile interior fool you, the Armada’s exterior quickly reminds you of its rugged roots. The Armada is built to withstand any harsh driving conditions, and with an impressive 5.6-liter V8 engine there is no lack of power. Still looking for more storage space? Then look nowhere else but up, because the Nissan Armada comes equipped with roof racks for any equipment that couldn’t be stored inside the cabin. Year after year the Armada proves why they are one of the most reliable and versatile SUVs on the market today. This vehicle was designed to be the ultimate vehicle for both drivers and passengers to adventure in, every seat in this vehicle can be considered the best seat in the house. The Armada comes in three different trims and a large palette of potential colors to choose from! Come into our Quirk Nissan located in Quincy, MA today and see our extensive vehicle inventory and find some of the lowest Armada lease offers and best prices around! Excludes taxes, doc, acquisition, title, license and first payment. $2,999 initial down payment required at consummation. (INCLUDES $3,975 manufacturer's rebate applied to $279/Month lease or $399 with $0 initial down. Offer valid only when financed through Nissan Motor Acceptance Corporation.) Subject to residency restrictions. 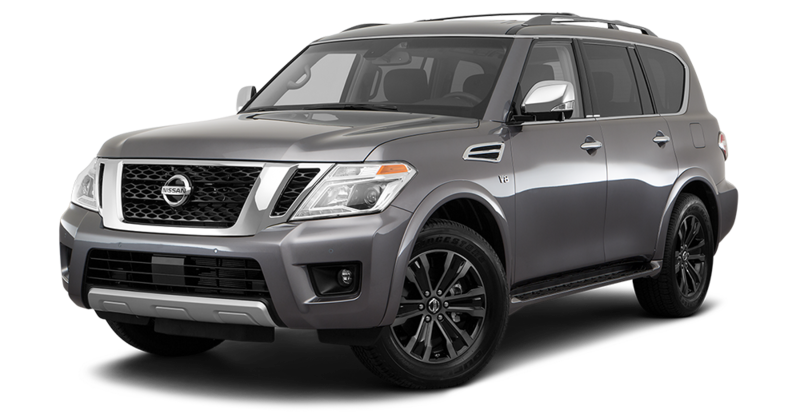 2019 Armada SV 4WD Lease model 26219 subject to availability to well-qualified lessees through Nissan Motor Acceptance Corporation. $53,020 MSRP incl. destination charge. Capitalized cost of $49,101. Monthly payments total $6,696 or $14,364 with $0 down at lease end, purchase for $32,342 plus purchase option fee up to $300, plus tax, or pay excess wear use plus $0.25 per mile for mileage over 10,000 miles per year. Lessee is responsible for maintenance and repairs. A disposition fee is due at termination of lease term. No security deposit required. Must take delivery from new dealer stock. Offer ends 04/30/2019.